Where can you hear 14 of the finest improvising sonic art performers play for over seven hours for only a fiver? Only at Sonic Vigil, Cork's annual mega-festival of everything that is loud, delicate, ferocious, quiet, expressive, innovative and down-right thrilling! I am especially pleased to announce that I am on the bill this Saturday 22 October at Triskel Christchurch in Cork City. My set is at 7pm but you'll want to see as much of the show as you can. Drop in and out during the day starting at 2:30pm sharp. As a bonus, video artist Claire Guerin will be accompanying the sound artists. 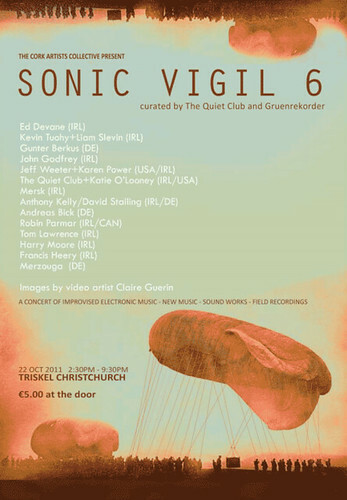 Now in its sixth year, Sonic Vigil is presented once again by The Quiet Club (Ireland) and Gurenrekorder (Germany). Download the PDF catalogue from their site. I have been preparing for Sonic Vigil by selecting possible source sounds and tweaking my performance instruments. My set will continue some of the themes I explored at Strange Attractor in April. I will be using a mix of processed live sounds and those previously recorded on location. These I capture by three methods: air pressure microphone, contact microphone and induction coil. Thus the performance channels acoustic sounds as well as those that generally go unheard -- the silent sea of electromagnetism in which we swim. My goal is to create a sonic space that questions our relationship to the natural and manufactured worlds. The tools I use for recording and processing themselves become part of the composition. The resulting piece comments on the act of observation and cognition since the process is fundamentally subjective; the origin is my own self. My actions are predicated on the acoustic environment as I hear it at that moment. Not only do my gestures with the microphones have an overt effect, my body and its positioning affects the sounds through capacitance and otherwise. The "wild-card" is the use of phonography to incorporate previously visited environments. This keeps things fresh for me, and gives me something external against which to act. The resulting soundscape contains subtle structures and varied timbres that play with concepts of memory and forgetting, ecology and technology, cybernetics and autonomy. This is part of my ongoing practice; every performance is inherently experimental. Please join me on Saturday to see how it goes! Don't forget you can hear many of my previous performances and compositions over at my Remanence site. Please contribute what you can to fund my research and artistic activities. Every little bit is appreciated. Thanks! Original works on this site are © 2005-2015 Robin Parmar. Contact me for licensing.